concealer on the wig, too. I cleaned it up, but now that one section of hair seems to have lost the bouncy curl and it’s just bedraggled. I’ve never had enough hair to style before, so I don’t know what to do. Also, the wig seems to either be too far forwar or the sides are too far back. Here is a pic of it before all the nonsense and before I had cut the lace. Any advice or assurances that I haven’t just wasted $250 would be appreciated . hi and welcome to the forum! I'm not sure I have a lot of advice to give you though. I've never tried a human hair wig and never had to use any glues or tape. Also, I've never cut any of my lace fronts. Hopefully one of the ladies here with more experience with HH will be along soon to help. I'm assuming your wig has ear tabs though and you should be able to use those to help you with the correct placement of the wig on your head. Have you watched any wig videos yet? You can find them showing almost all aspects of wigs and their care. With an HH wig you are going to have to do some basic styling even if you wear it straight. Was there a reason you chose this over a synthetic wig? I love my wig grip. I’ve gone down roller coasters and my wig hasn’t come off! Hi! I went with HH because I wanted it to look as natural as possible and that seemed like the best way to make it undetectable. I have suffered with thinning hair (you can see my scalp everywhere) my whole life and just wanted to finally be able to go outside without a hat on. There were some sections of the lace that overlapped on each side, slightly heavier and more noticeable. Maybe those were ear tabs, but they were very obvious and when I had them in place in front of my ears, the rest of the wig was covering half of my ears. You say you’ve never cut your lace fronts, but the lace was long enough to cover my eyes. I don’t understand how one could not cut the lace before wearing. I've only ever worn synthetic wigs and, while I know that AA wigs have long lace like that which has to be cut, most that are made for caucasians is very short. Some people still choose to cut theirs but I've never had to. You can look at my profile picture and see that it isn't noticeable. The wig in your picture looks very natural but seems to be sitting a little too far back. Is the wig a good fit or too large for you? What brand is it? #Donnak has a good suggestion for keeping it from sliding around without using glues or tape. Many women use these wig grips. Not me, because I find them uncomfortable, but others here swear by them. Just Google wig grip and you will see them. HH isn't the only way to have a natural looking wig. Most synthetics look very natural now, especially those made with HD or heat defiant fibers. These fibers are less shiny than regular synthetic. What brand is your wig? It definitely sounds like something that should have been customized for you at the wig store or salon. And I agree...the front should be right at your hairline. Anyway, find a professional who can work with you on this expensive purchase. What kind of hair grip did you get? I've been looking at them and wondering, but there are different kinds. I wear lace front synthetic wigs with Milano wig grip caps or bands. No movement, very comfortable. So long as you center using ear tabs, making sure the front hairline is ~4 fingers above your brow, you should have a good fit. I’d also recommend watching YouTube videos for suggestions. I agree with Alicexm, Milano wig grips are great. I use the considerably more expensive wig grip with attached cap, but it’s worth it to me. As for the lace, you are supposed to cut it off. Though I’m sure many wigs don’t need additional styling, many do, whether it be to cut bangs, layering around the face, etc. Your best bet would be to go to stylist, and with your wig on, ask them to shape it up. If you bought it online you probably picked it based on style model was wearing - take that photo in. Or, if not online, find photo of style you like and take to salon. 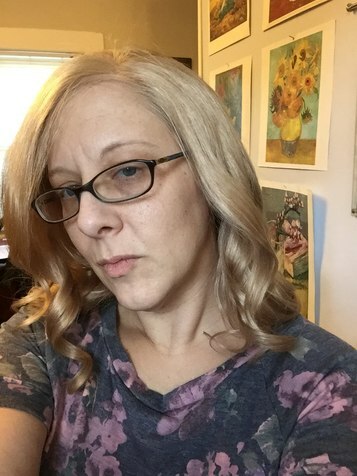 I’m relatively new to wigs and have had three HH wigs so far. I’ve read a lot online and watched a lot of YouTubes. I still have a lot to learn, and each wig has been very different. It seems like it’s going to be a bit of trial and error. Hope this helps a little. Patti of Patti’s Pearls has some really good YouTube videos. I’ve found her videos very helpful for styling, wearing, and caring for my girls. I agree with Vee1088. It appears your wig is sitting about a inch to far back. It amazing how a small amount make so much difference. I trim my lace and use Got2bGlued. I place it just behind where the edge of the lace would stop. It’s water soluble and perfectly find if it gets in your hair. Simply spritz warm water where you applied the glue and it easily comes off (when your ready to remove the wig). I no longer worry about my wig coming off. It doesn’t damage the lace either. Good luck! Hi Anne, I have worn wigs for about 20 years for the same reasons you want to wear them. My hair was very thin all over. I wear full synthetic wigs that look very natural. No one knows I wear wigs. I can afford HH wigs and have purchased 2 over the years. I spent over $1000 on each one. I hated them with a passion and wlll never buy a HH again. The main reason is because I don't know how to style hair. The second reason is that they are heavy and feel terrible to me. I prefer synthetic wigs, mono top with lace front. I have never had to trim the lace. They look very natural and they maintain their style. Right now I normally buy HD wigs and the fibers look very natural. The non-HD wigs tend to be shiny so I spray them with dry shampoo and they look great. Also I never use glue but I do use the Milano wig grips. Jon Renau and Raquel Welch have some really good lace fronts and mono tops. I use them the most. Hi - I just signed up, having found this thread. I too am trying to decide between a synthetic or HH wig. Having worn synthetic wigs in the past I would prefer that, as I am not really strong at styling and I think I'd have my hands full with a HH. But - In the past I have always felt self conscious with the synthetics, I felt with many of them it was obvious I was wearing a wig. I have heard really good things about envy wigs...Can anyone give me some feedback? Any other recommendations on what wigs/brands to buy would be appreciated. Oh and SuzieQ, your wig looks SO natural - Would you mind telling me what brand it is? Thank you all for the help. You may need to take it to the barbershop, find the hairdresser, and fix it again! It All depends on the quality of the wig. A good quality lace wigs doesn't Need that much work. All you have to do Is to treat It like your own hair. By so doing, It can last years. I've 360 lace frontal, 250% density(which Is a lot of hair) glueless human hair wigs. I'm at your disposal for any information.